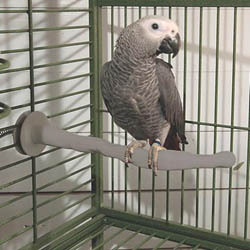 The Thermo Bird Perch is a unique heated bird perch that maintains an optimum temperature range between 102 - 107 degrees fahrenheit. It is a thermostatically controlled product using a safe, low voltage (12 volt) power source that can be left on continuously, so your bird can enjoy warmth any time he needs it. Note: A bird's optimal body temperature is 102 degrees fahrenheit. Recommended for large birds such as Macaws, large Cockatoos, Toucans and similar sized birds. 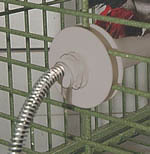 Steel wrapped cord is easily attached and positioned away from cage. NOTE: Thermo perch is easily cleaned with soap and water using a soft cloth. UNPLUG BEFORE CLEANING AND DO NOT IMMERSE IN WATER.